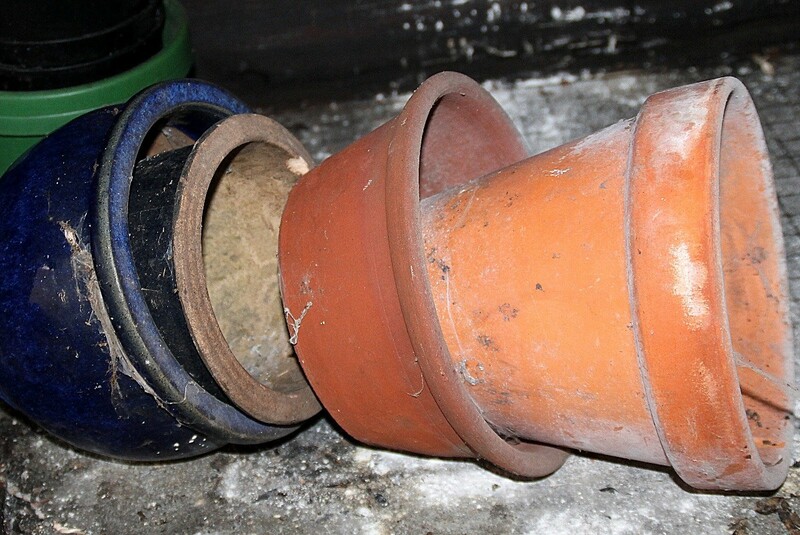 It is a good idea to clean both new and used pots before replanting them. New pots can have a chemical residue and previously used pots and planters may have salt deposits, diseases from previous plants, mold, fungus, insect eggs, or weed seeds. The few minutes you take to clean your planters will be well worth it and can help ensure healthy, beautiful plants this growing season. Pots can be cleaned in the fall at the end of the growing season or in the spring before replanting. Remove the potting soil or other planting medium and discard. Even if the soil is not harboring plant diseases, etc. the soil often becomes compacted over time and restricts air flow to the roots. Additionally, the nutrients in the soil may be depleted. Rinse out any loose soil with a garden hose. Salt deposits can be scrubbed or scraped off. Steel wool sometimes works well for this process on some finishes. You are now ready to get down to the thorough cleaning. You will need water, a brush (stiff bristles for concrete planters, softer ones for terra cotta and plastic, and a soft brush for fiberglas and resin pots), soap (a mild dish soap will work), and perhaps a mild bleach solution, 10%, especially for concrete planters and pots where disease has been a problem with the previous plants. If you need to use bleach, gloves and goggles are a good addition to your supplies. Give the pots, trays, troughs or saucers a good scrubbing with your brush and soapy water. Rinse thoroughly. Use the bleach solution for concrete planters and any others that previously had diseased plants in them. If the planter is small enough, soak it in the mild bleach solution for 10 minutes or so. For larger pots you can either make a slightly stronger bleach solution and wipe down the inside and outside of the pot or use a spray bottle (approved for use with chemicals) and spray the inside and outside of the planter. When disinfecting concrete planters or other rough textured, porous pots wear your gloves and goggles and use your stiff brush to scrub down the the planter allowing the solution to penetrate the texture of the planter or pot. Once you have scrubbed and soaked the planters make sure to rinse thoroughly. Those small enough can be soaked for an additional 10 minutes to remove all soap or bleach. Larger planters should be hosed off to remove bleach and soap residue. Allow the planters to dry thoroughly before replanting. bleach is so toxic. What do you do with the rinse water after the project is finished? Would vinegar work just as well without the toxic after effects?